Step by step guidelines on How to know your Property value under Citizen Service option in banglarbhumi.gov.in 2018 website….. The state government of West Bengal runs a web portal for land records and reforms. This web portal (Banglarbhumi Website) helps citizens of West Bengal in retrieving any land or property related information such as plot number, land area, value of the property, name of the owner just to mention but a few. Having details on Know your Property value of your land is very important to a buyer or owner especially when you want to make a purchase. With Banglarbhumi Website, residents of West Bengal no longer have to incur transport costs in order to get land related services. This is because they can now rely on the site to get these services at any time that they term appropriate since it operates 24 hours a day. All one needs is an internet connection together with a device that can access the internet be it a Personal Computer, Desktop computer or tablet. Know Your Property and get this information can follow the simple steps given below. 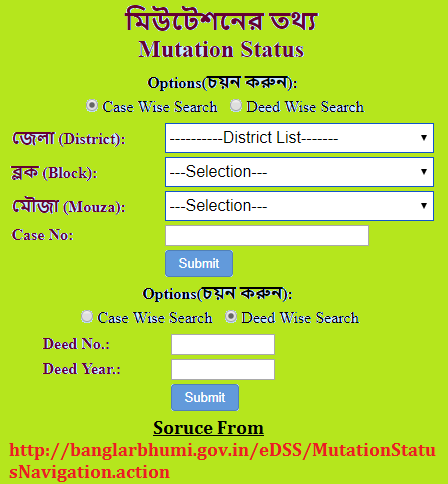 Enter http://banglarbhumi.gov.in on the search bar of your installed browser i.e. Google Chrome, Mozilla Firefox or internet explorer. This is the official link of Banglarbhumi website. Press the “Enter” button on your device to initiate the search process. You will then be redirected to the official homepage of Banglarbhumi Website. On the homepage of Banglarbhumi Website, click on “Citizen” tab. A drop down menu will appear on your screen from where you should click on “Know Your Property” option. You will be redirected to a new page on the site. Here, you must carefully fill in the District, block and Mouse (Village) details in the space set aside for this information. Select the option that you wish to use in searching for your property value information i.e. using plot number or using Khatian number. Click on the ‘Submit’ button after filling in all the details correctly. After submitting the details, they will be matched with the current records before finally getting the required details. You will then be able to see your property or land information without facing any issue. Banglarbhumi Website has come at the right time when almost every state government is making use of the internet to offer quick and efficient services. Initially, people had to avail themselves physically in West Bengal land records and reforms offices in order to get a given Service. This proved to be time consuming since you would sometimes encounter long queues or closed offices. Fortunately, this is now a thing of the past since you can get these services from the comfort of your house, Car or even Office. Remember to make use of a fast internet connection when visiting Banglarbhumi Website. Failure to do this, you will have to cope with slow browsing speeds which increases the time taken to get your land or property information. Government of West Bengal together with the State Land & Land Reforms Department is now providing fee payments services online. This is made possible thanks to Banglarbhumi website, an online web application that mainly serves West Bengal residents. Banglarbhumi website was developed for the main purpose of promoting transparency whenever you want to access Land and Land Reforms Information. Before using Banglar Bhumi website, you will need to have a fast internet connection. In addition to this, you must also make use of a device that can access the internet be it a Personal Computer, Desktop Computer or Smartphone. Below is a step-by-step guide on how to use the fee payment service in Banglarbhumi website. As we’ve already told you that you’ll have to enter the banglarbhumi.gov.in web portal address in the search bar of your browser (Mozilla / Chrome / Safari / Opera). Here, you should go on the Online Application Section given in the Home Page and here Fees Payment Option will be shown accessing which you can reach on the particular page. The following are the detailed guidelines on how to check Fees Payment in the banglar bhumi web portal. Open West Bengal land records official website using https://banglarbhumi.gov.in as the link. This link will automatically redirect you to the homepage of Banglarbhumi Website. Next, place your mouse cursor on “Online Application” service. This action will generate a drop down box containing details like Mutation Application, Conversion Application, Fees Payment just to name but a few. 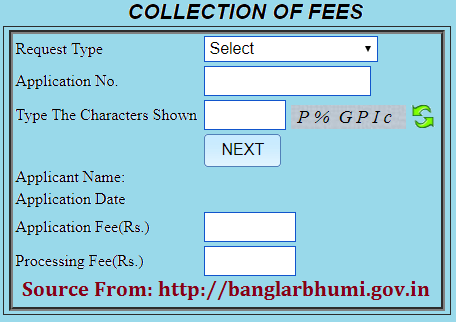 Click on “Fees Payment” option to make use of the fees payment service in Banglarbhumi. You will be redirected to a new page on the site containing Fee payment form. Here, you will have to select the “Request Type” by clicking on the dialog box set aside for this detail. This action will generate a drop down box containing details like Plot Map, Plot Information, Conversion, Mutation and Certified copy. Select the appropriate option that you wish to use by clicking on it. Next, type the characters that appear in the captcha image. Click on “Refresh” button if you do not see the captcha image clearly. Click on “Next” after filling in all the details correctly. You will now be able to see the Applicant’s name, application date, application fees and processing fees, which are in Rs. If you want to pay the fees using Net banking or GRIPS option then one has to register their Mutation Case Number. West Bengal residents who want to make their payment using “Counter Payment” will have to use the online application service for verification purposes. Here, they should click on “Application GRN Search” to verify the payment while also registering their case. People who do not receive a verification message after making the payment will also have to rely on “Application GRN Search” to verify their payment. The good thing about Banglarbhumi website is the fact that you can access all services without having to move from your current location. Moreover, you can make use of these services at any time of the day as long as the site is not under maintenance. This action has eased the pressure that comes whenever you have to avail yourself physically in their offices in order to get a service. With Banglarbhumi website, you will be able to get timely and effective services without having to move an inch. 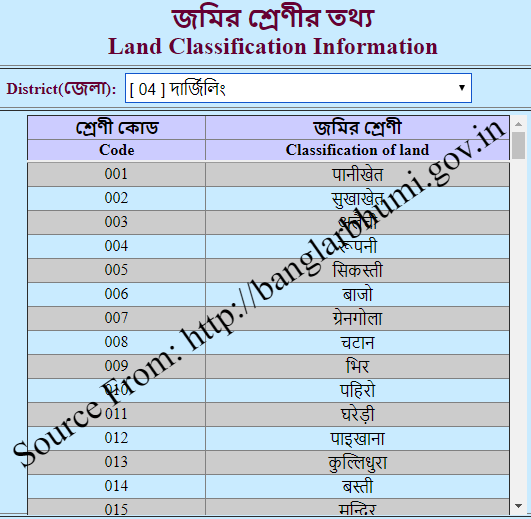 Banglarbhumi Land Classification is a web application that was launched by the State Government of West Bengal. This website is specifically set aside for the main purpose of providing information and services offered by the Land & Lands Department, West Bengal. Banglarbhumi website has proven beneficial ever since its inception. This is mainly because it is now easy for West Bengal residents to access any information pertaining to their plot or piece of land. Initially, you would have to look for a Land & Lands Department office before getting any service that you need. Fortunately, this is now a thing of the past since the services are now a button click away. You can get numerous services from Banglarbhumi website.However, you must have a device that can access the internet without causing any problems i.e. Personal Computer, Desktop Computer or Smartphone. With any of these devices, you can access any of the services given below. All property holders of West Bengal State can now follow the simple steps below to make use of Land Classification service available in Banglarbhumi Website. Open Banglarbhumi website on your browser by simply using http://banglarbhumi.gov.in as the official link. Press the “Enter” button on your keyboard once you type the above link correctly. The homepage of Banglarbhumi website will appear on your screen. Here, you will have to place your mouse cursor on“Citizen Service” Service. This action will generate a drop down box containing details like Know Your Property, Mutation Status, RS-LR Information and Land Classification. Click on “Land Classification”option. You will be redirected to a new page on the site from where you have to select your district. A drop down box containing the code and classification of land will then appear on your screen. It is advisable that you make contact with the concerned by Land LRO office if you notice any issue in the land classification detail. By doing so, you will be able to get the correct information that you need. With Banglarbhumi website, you will not have to worry about getting any service that they have to offer. This is mainly because they are all accessible via the internet at anytime of the day. 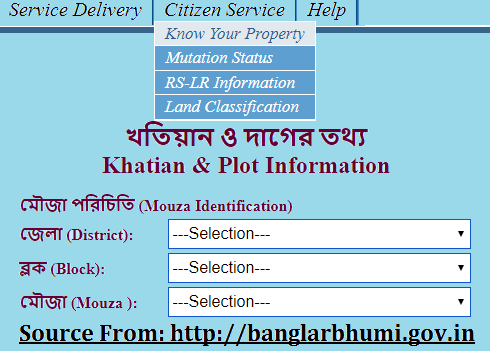 Procedure on Banglarbhumi website Plot Map Request Details in service delivery tab at banglarbhumi.gov.in…..
Department of Land & Land Reforms together with the Directorate of Land Records and Survey, West Bengal are now working together to offer services. This has been made possible through the Banglarbhumi website, which operates 24 hours a day. Any person who wants to use this option will have to make do with the simple guide given below. Enter http://banglarbhumi.gov.in on the search bar of your browser be it Google Chrome, Mozilla Firefox or Internet Explorer. Hit the “Enter”button on your keyboard after filling in the above link correctly. Place your mouse cursor on “Service Delivery” This action will generate a drop down box containing services like ROR Request, Plot Map Request, Request GRN Search etc. Click on “Plot Map Request” option to access the Plot Map Request service. You will then have to select the District, Block and Mouza from the drop down boxes set aside for these options. You will also have to fill the personal details like First and Last Name, Email ID, Mobile Number and Address.Make sure that you fill in these details correctly. Enter characters that appear in the Captcha image. You may sometimes fail to see any characters. In this scenario, you will have to click on the “Refresh” button to generate new characters that you can now use. Click on the “Calculate Fee” button that is below your personal details. Continue with the payment option by using online payment method be it Net banking or Credit Card. You will then receive a verification message once you make the payment. If you do not get any message, then you will have to use “Request GRN Search” option to verify the payment. This action will also help in availing your signed copy. Alternatively, you can make the payment by visiting the relevant offices. After doing this, you can verify the payment using Banglarbhumi website. To perform this action, you will have to place your cursor on “Service Delivery” option before clicking on “Request GRN Search”. You will now be able to verify your payment while at the same time registering a case. Any person who has used Banglarbhumi website will tell you that it is the best Land records site. This is thanks to the timely and transparent services, which West Bengal residents can access from any particular location.Furthermore, you will not have to carry cash in order to make a payment since Net banking is set aside for this purpose. All you have to do is link your bank before using net banking services. By doing so, you will be able to use the net banking services.